Well this was a challenge of mine…. to create a Texas Sheet Cake. 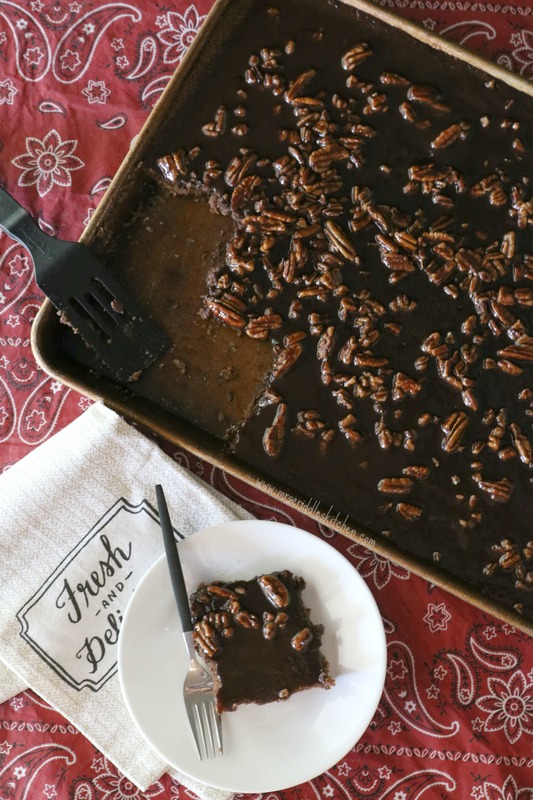 Texas Sheet Cake is my absolutely FAVORITE cake of all times! I’ve made the sugary kind so many times as a teen and I’ve missed it. We called it Wacky Cake. Not really sure why. 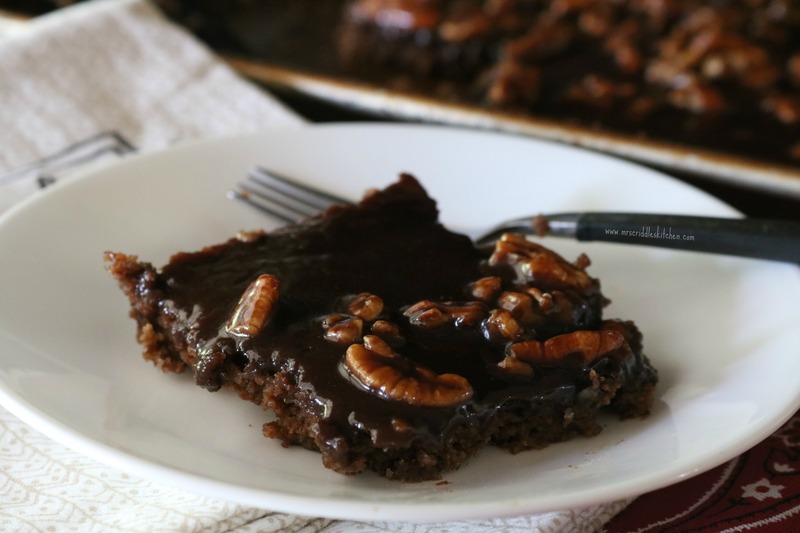 But either way, this is a rich chocolaty dessert! What makes this cake even better is the fact that this is SUGAR FREE! I use the THM Gentle Sweet because I love the taste! If you have a sweetener that you like, stick with it but if you can use THM Gentle Sweet. Yep. AND it’s GLUTEN FREE! So no worries if you are gluten sensitive!! ALSO, it will fit in your Trim Healthy Mama plan! It would be considered an S or low carb (keto friendly too) because of the higher fat and low carb! This is a very rich moist cake! And it works best cool in the fridge before eating & if you keep in the fridge! 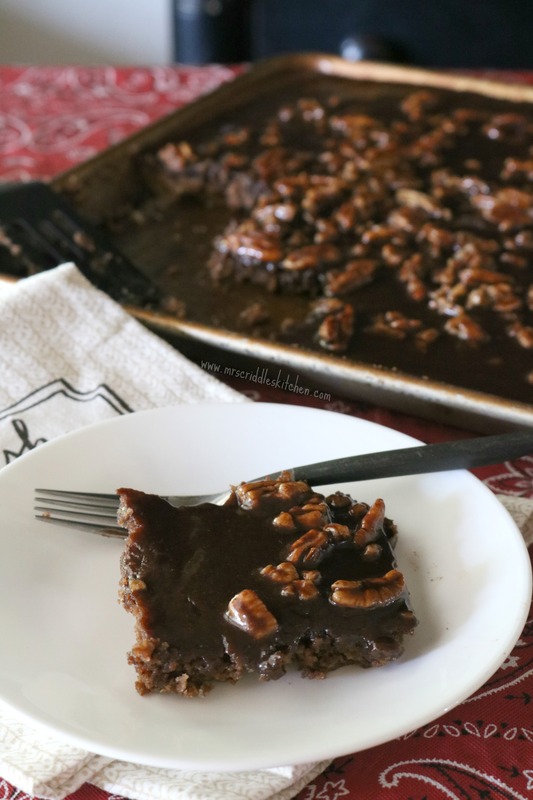 A yummy sugar free, low carb take on a Texas Sheet Cake! Spray a 13X18 cookie sheet with coconut oil spray. In a big bowl, add the almond flour, coconut flour, cocoa powder, salt, cinnamon, baking soda, sweetener, and hot water. In a microwave safe bowl heat butter until melted. Add in the greek yogurt or sour cream & mix. Add the butter & yogurt mix to the batter. Mix well and add the eggs. In a sauce pan add butter, sweetener, cinnamon, cocoa powder, cashew milk, and a pinch of salt. Heat on medium heat until it begins to boil. Allow to boil for 30 seconds while mixing well. Remove from heat and add the vanilla and pecans. Pour the icing over the cooled cake. Place in refrigerator to chill for an hour at least. Please keep cold! This cake stays more firm when kept cold in the refrigerator!